The proud 17th year of Sentamizh Cholai was acknowledged by presenting the prestigious "Gandhiya Chemmal" award to the founder of the Gandhi World Foundation, Mr. M.L.Rajesh. 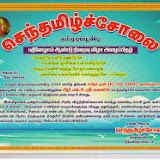 Sentamizh Cholai is a literary organization which functions at Gummudipoondi. It recently stepped into its proud 17th year of literary service and on remembrances of this occasion the organization celebrated it by presenting the prestigious award of “Gandhiya Chemmal” to the Founder of Gandhi World Foundation, Mr.M.L.Rajesh. We wish to extend our humble gratitude to the great poet, Dr. V.Vijayarangan and also the other members of Sentamizh Cholai who elected Mr.M.L.Rajesh as the title winner. In front of many leaders and also Philanthropist C.Kandasamy, Gummudipoondi M.L.A.C.H Sekar presented the above said award. This award is believed to definitely increase the pace of Mr.M.L.Rajesh and his service minded policies. Gandhi World Foundation would like to extend its humble gratitude towards all the noble minds of Sentamizh Cholai who were behind in electing Mr.M.L.Rajesh as the title winner.